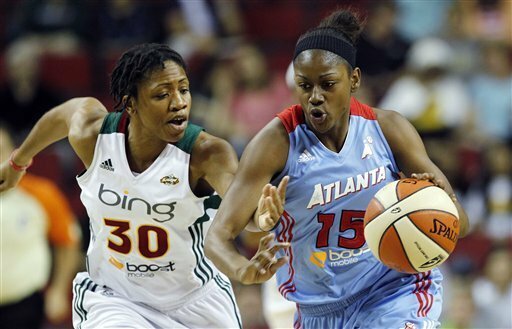 SEATTLE (AP) — As Sancho Lyttle saw things, what mattered most for the Atlanta Dream was finishing what they started. Lyttle scored 21 points to lead the Dream to a 70-59 victory over the Seattle Storm 70-59 on Wednesday. Lindsey Harding added 15 points for Atlanta (9-9), which is now 3-2 on a six-game road trip that ends on Friday night in San Antonio prior to the WNBA’s monthlong break for the London Olympics. Tiffany Hayes and Aneika Henry chipped in 13 apiece. The Dream never trailed and took the lead for good as Lyttle and Armintie Price hit consecutive jumpers to put Atlanta up 31-27 with 2:42 to go in the second quarter. Henry made two free throws to put the Dream up four at the break, and an 8-0 run to open the third quarter pushed the advantage to 44-32. ”Normally, we do get off to a good start. But keeping it was more important, and that’s what we did,” Lyttle said. ”We just know that we had a bigger lead in the first half and they came back and cut it within one. We tried to go out the same (after halftime) that we started the first quarter. ”We go up a lot, and then lose the lead in the fourth quarter. We just needed to carry on what we were doing,” Lyttle added. The Storm pulled to 53-46 heading to the fourth, but got no closer the rest of the way. The Dream pushed the lead to 13 in the fourth. Rookie Shekinna Stricklen scored a season-high 16 points and Tanisha Wright had 12 for the Storm (8-10). Sue Bird, set to play for the United States at the London Olympics, was limited to just five points after scoring 31 last Sunday against Phoenix. The Dream hit their first four shots of the game, while the Storm missed their first five. Atlanta wound up at 48 percent (29 of 61), and kept Seattle below 40 percent (21 of 53). Storm coach Brian Agler said some of those last-second tries that went in played a role in keeping Seattle in comeback mode all afternoon. ”We just didn’t finish off defensive possessions, and I thought they played really well down the stretch on their offensive possessions and on a late shot clock,” Agler said. ”We just could not get a lot done at the rim. That also showed in the rebounding numbers, which the Dream dominated 34-25. That included nine at the offensive end, leading to a 13-2 advantage in second-chance points. ”Any time we can outrebound folks and push it up, the running game is our game,” Meadors said. Atlanta was without leading scorer Angel McCoughtry (22.6 points per game) for the third straight game because of a knee injury. Seattle was missing leading rebounder and second-leading scorer Ann Wauters (6.2 boards, 10.3 points) for the fourth straight game with a strained left Achilles.